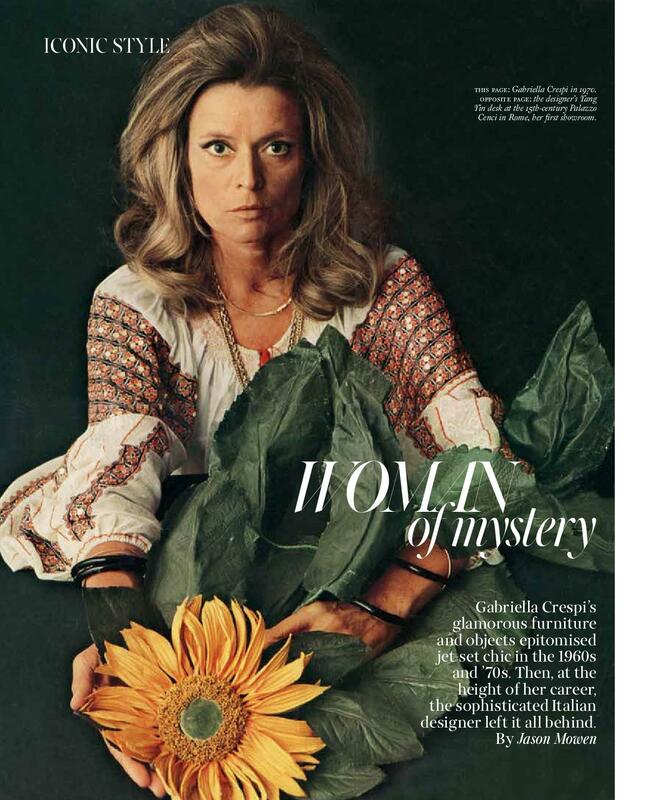 Like Garbo, Crespi was also dazzlingly beautiful and a brilliant artist, the reigning queen of the Italian decorative arts scene throughout the 1960s and ’70s. Renowned for mainly one-o objects, furniture and lighting pieces in highly polished metals, plexiglass and bamboo, Crespi created sculpturally formed designs that re ected the international, jet-set chic of her equally glamorous clientele — the Shah of Iran, King Faisal of Saudia Arabia and Princess Grace of Monaco to name a few — and was a key gure in the decorative arts renaissance that took place in her native Italy, and beyond, at the time. 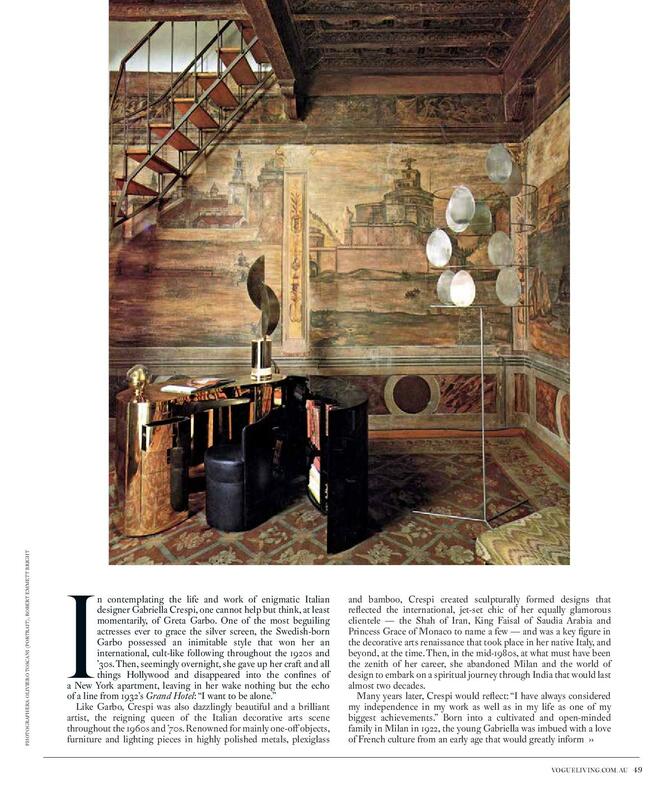 Then, in the mid-1980s, at what must have been the zenith of her career, she abandoned Milan and the world of design to embark on a spiritual journey through India that would last almost two decades. Many years later, Crespi would re ect: “I have always considered my independence in my work as well as in my life as one of my biggest achievements.” Born into a cultivated and open-minded family in Milan in 1922, the young Gabriella was imbued with a love of French culture from an early age that would greatly inform her work as a designer. She graduated from the Brera Academy of Fine Arts and then studied architecture at the Polytechnic University of Milan, one of just a handful of women to do so at the time. In 1948 she married Giuseppe Maria Crespi, whose family, prominent textile industrialists, owned the national daily, Corrierre Della Sera; they had two children, Gherardo and Elisabetta, but separated in the late 1950s. 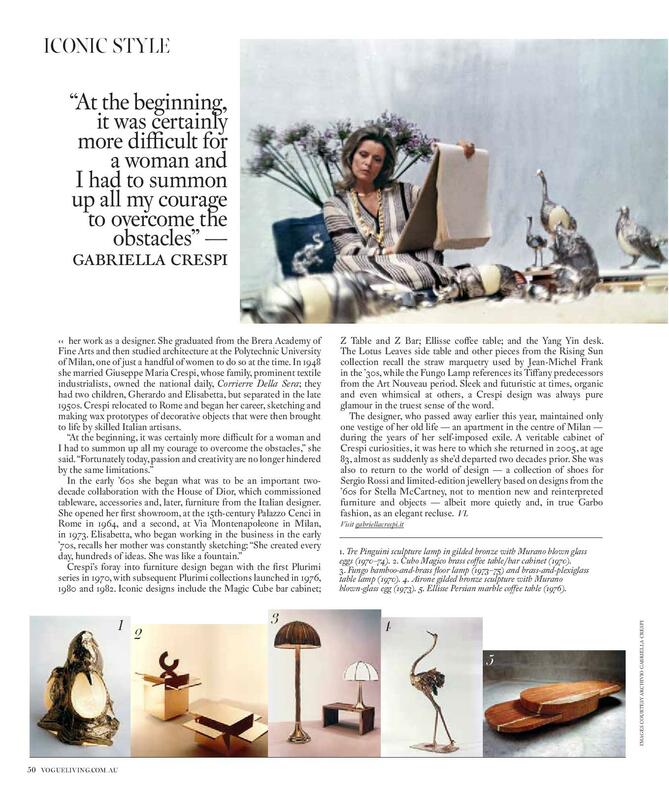 Crespi relocated to Rome and began her career, sketching and making wax prototypes of decorative objects that were then brought to life by skilled Italian artisans. Crespi’s foray into furniture design began with the rst Plurimi series in 1970, with subsequent Plurimi collections launched in 1976, 1980 and 1982. Iconic designs include the Magic Cube bar cabinet; Z Table and Z Bar; Ellisse coffee table; and the Yang Yin desk. The Lotus Leaves side table and other pieces from the Rising Sun collection recall the straw marquetry used by Jean-Michel Frank in the ’30s, while the Fungo Lamp references its Tiffany predecessors from the Art Nouveau period. Sleek and futuristic at times, organic and even whimsical at others, a Crespi design was always pure glamour in the truest sense of the word. 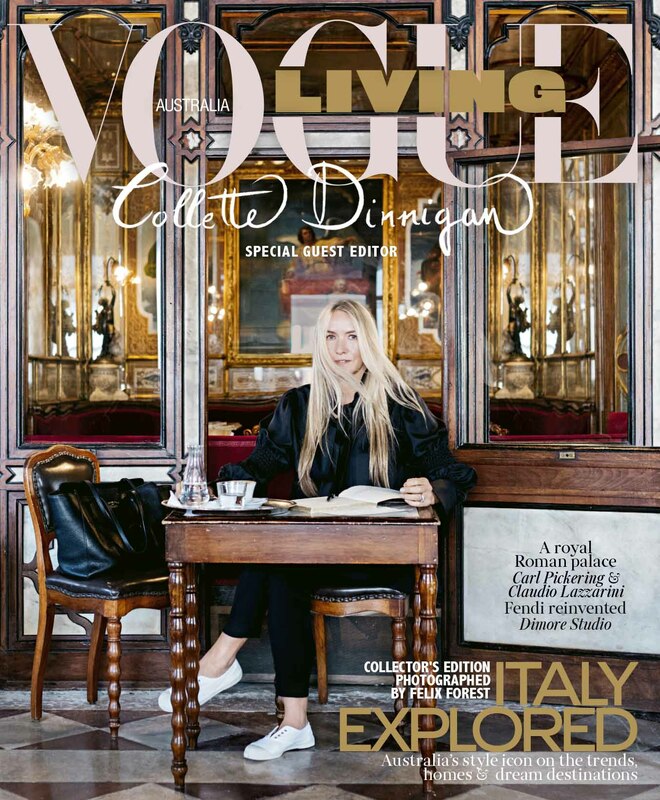 The designer, who passed away earlier this year, maintained only one vestige of her old life — an apartment in the centre of Milan — during the years of her self-imposed exile. A veritable cabinet of Crespi curiosities, it was here to which she returned in 2005, at age 83, almost as suddenly as she’d departed two decades prior. She was also to return to the world of design — a collection of shoes for Sergio Rossi and limited-edition jewellery based on designs from the ’60s for Stella McCartney, not to mention new and reinterpreted furniture and objects — albeit more quietly and, in true Garbo fashion, as an elegant recluse.